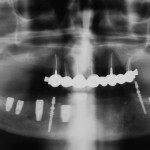 The main aim of this systematic review was to quantitatively estimate the survival and success rates of immediate implants and the implant-supported prosthesis, the prevalence of biological, technical and aesthetic complications, and the magnitude of soft and hard tissue changes following implant placement in fresh extraction sockets. The MEDLINE (PubMed) and the Cochrane library databases were searched as well as manual searches of the bibliographies all full text articles and a range of relevant journals. The authors selected randomised controlled trials(RCTs), prospective cohort studies and case series with a minimum of 10 subjects in the immediate implant placement group having a mean follow-up time ≥12 months. Only English language studies were included. Studies were quality assessed and data abstracted independently by the two reviewers. The risk of bias of RCTs was assessed using an approach suggested by the Cochrane Collaboration,with prospective cohort studies being assessed using the Newcastle–Ottawa Scale. 46 prospective studies (10 RCTs) were included. The mean follow-up time was 2.08 years. The annual failure rate of immediate implants was 0.82% (95% CI: 0.48–1.39%),translating into the 2-year survival rate of 98.4% (97.3–99%). Among the five factors analysed (reasons for extraction, antibiotic use, position of implant [anterior vs. posterior, maxilla vs. mandible), type of loading], only the regimen of antibiotic use affected the survival rate significantly. Lower failure rates were found in groups that were provided with a course of postoperative antibiotics. There was limited reporting of biological, technical and aesthetic complications. Soft tissue changes occurred mostly in the first 3 months after the provision of restoration, and then stabilized towards end of the first year. Marginal bone loss predominantly took place in the first year after implant placement, with a magnitude generally less than 1 mm. Controversy on hard tissue preservation with platform switching technique remained unsolved. Despite the high survival rate observed, more long-term studies are necessary to determine the success of implant treatment provided immediately after tooth extraction. Special attention has to be given to aesthetic outcomes. Lang NP, Pun L, Lau KY, Li KY, Wong MC. A systematic review on survival and success rates of implants placed immediately into fresh extraction sockets after at least 1 year. Clin Oral Implants Res. 2012 Feb;23 Suppl 5:39-66. doi:10.1111/j.1600-0501.2011.02372.x. PubMed PMID: 22211305.